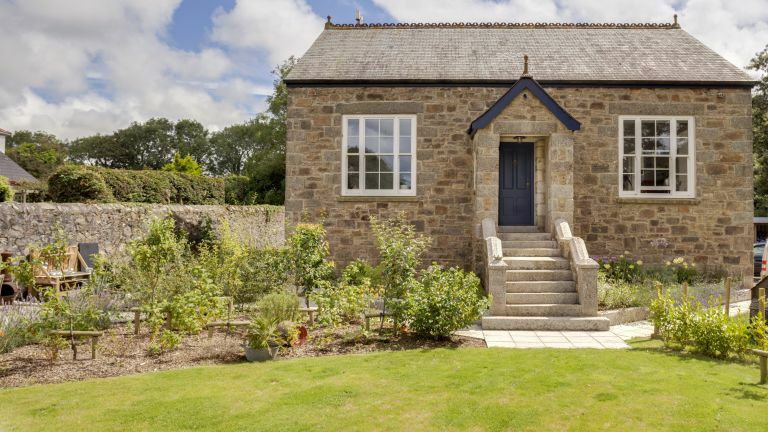 Whether you're passionate about renovations, looking for inspiration to plan your own, or simply fancy a look inside a beautifully renovated schoolhouse, you're sure to fall in love with this stylish combination of original features with contemporary interiors and distinct family feel. Read on to see how homeowners Katy and David Green retained the schoolhouse charm in their renovation. Love this? See all our real home transformations. Read our guide on renovating a house, too, for more guidance. Looking back, it seems a bit reckless how Katy Green and her husband David bought an old school that had been converted into offices, at auction, without planning permission, having sold their previous house and without anything to move into. They spotted the property in the local newspaper, went to have a look, and headed to the auction. ‘David was wearing a bobble hat and nodding as he bid, so the bobble was just nodding away!’ laughs Katy. ‘It was “going once, going twice” at £112,000, and we thought we had it. Then a new bidder chipped in, so it ended up going for £150,000 “to the man in the bobble hat!”’ An immediate deposit was required, and a few frantic calls to the bank secured a loan and the house. But what they bought was a far cry from either the original school or the lovely home they now live in. Outside, there were three prefabricated huts spanning 100 feet, 12 telephone lines and a 22-space car park. They secured planning permission, but because it was a ‘change of use’ they couldn’t get building regulations sign-off – or a mortgage – until the end of the project. A bridging loan from family saved the day. Once funds were in place, the couple ripped everything out – right back to the original stone walls. ‘Anything we could do ourselves we did,’ says Katy, whose hands-on approach extended to living in those prefabricated huts on site throughout the 18-month build – without a shower and with only camping stoves to cook on. They commissioned a timber frame for inside the external walls, insulating between the two, so today, the Aga is all that is needed to keep the whole house warm, even in winter. They had all the windows replaced and the joists at the back of the building cut, raising the floor level to add height to two new bedrooms in the basement. Downstairs, a damp-course membrane and concrete floor were added, while masons punched windows into the stone walls of the basement, adding granite lintels to match those used elsewhere. ‘It was a big, scary job,’ says Katy. At the same time, they were re-roofing – replacing the modern cement tiles with traditional slate, and reclaimed ridged tiles that Katy sourced for the top. ‘I enjoy hunting things down, but finding a 12-metre run of reclaimed ridged tiles is really hard,’ she admits. They sandblasted and repointed all the stonework, replaced the fascias and removed a modern door from the front of the storm porch. Inside, they lowered the ceilings in the lounge and master bedroom but kept the full 14-foot height in the main living space. ‘I love a big living/ dining space, so I really wanted to keep it,’ says Katy. A bedroom and bathroom up a few stairs, and the two bedrooms tucked into the basement, complete the space. They then sanded the original floors in the bedrooms and living room, pulling out staples one by one. ‘It was a labour of love,’ says Katy, who opted for herringbone parquet in the main space. The old school lockers were found on Ebay and provide a handy storage solution in Gladys’ room. The bed is from Ikea and the prints on the wall are by Esther Connon – an artist friend of Katy’s mum. The little green chair came from a mid-century antiques fair. They had just finished plastering when disaster struck. ‘The ceiling suddenly cracked,’ says Katy. ‘We had to take the whole lot down. I did have a little cry at that moment.’ The light at the end of the tunnel soon appeared, though. ‘The kitchen was one of the last things to go in, and the day they fitted the Aga just felt really lovely,’ she says. Katy scoured the country’s reclamation yards and online auction sites throughout the build to find furniture and accessories to suit her industrial mid-century style, and elements of the internal architecture were built around her finds. Most of the interior came together instinctively as Katy collected things she liked, taking care to keep the look simple. ‘We limited the colour palette to white and wood, with the odd accent of grey or red,’ she explains. The slow evolution of the garden, which now includes a sun terrace, raised vegetable beds and a family of chickens, is what finally makes the project feel complete: ‘Each year things are growing and that makes it feel like home,’ says Katy.